Established in 2004, Yumi Kim is a New York-based label best known for putting modern spins on would-be vintage-inspired designs. With a delicate, feminine vibe, these shorts have soft and flattering silhouettes to take you from daytime to evening in a flash. 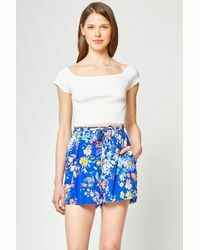 Exuding signature style, these shorts are patterned with contemporary floral designs incorporating a rich colour palette. What’s best about them? Everything’s made using smooth silk.